Here is a glimpse of my politics. It came home to me once again this morning that heaven sure is not waiting for me way down at the end of life's road. Any heaven we get will be right in the here and the now, and we will have to create it for ourselves is my belief. Today was simply more proof of it. We picked organic blueberries just outside of town. Michigan is the number one provider of blueberries in the U.S., along with being the main pickle state, and is big on cherries as well. There is so much turmoil in the world, not to mention the stupid politics and general financial inequality here in the U.S., that looking for an end to it all in real-time is no longer practical. It's getting worse, not better. The government seems unable and unwilling to do anything. I no longer even identify with the stock market. It goes through the roof, but seems not to affect ordinary people like ourselves. It is a non-sequitur at this point, something perhaps for the 1%. Something I do find is that more and more people I know are going local and not waiting on the government to solve their problems. For instance, in Grand Rapids, regular people, folks just like us, have bought and rebuilt the Wealthy Theater and now all kinds of music and performance is taking place there without control from above (see link below). And this is happening all over. The largest food co-op east of the Mississippi is the Oryana Food Coop in Traverse City, Michigan, again: wholly owned by members. We shop there when we can and it is a 1-1/2 hour drive from where we live. I don't know what happened to "Power to the People!," but local people power is what is happening. My point is that local do-it-yourself community effort is the way things are going. Waiting around for government to take care of these things has become an embarrassing exercise in futility. We are gradually taking control of our own communities and learning to provide for ourselves as much as we can. At least we the people are responsible or beginning to respond. The government is broken. This for sure is the gentle revolution, a quiet riot. As mentioned, I was reminded of this earlier today while we were out in the countryside near where we live picking organic blueberries. The sun was shining, a light breeze was blowing, and, although there is autumn in the air, it was not yet too cold to enjoy being outside. Of course, my wife Margaret had to kind of root me out of the house, but what's new? We could hear the eerie cries of what must be Whooping Cranes in the distance and at one point some of them flew overhead. And there were just millions and millions of blueberries all around us, not just on the bushes, but all over the ground. And there I was with a bucket tied to my waist by an old belt, just picking berries. I probably ate almost as many as I picked, but here was a little bit of heaven in a world of back-to-back events, just a moment in time. 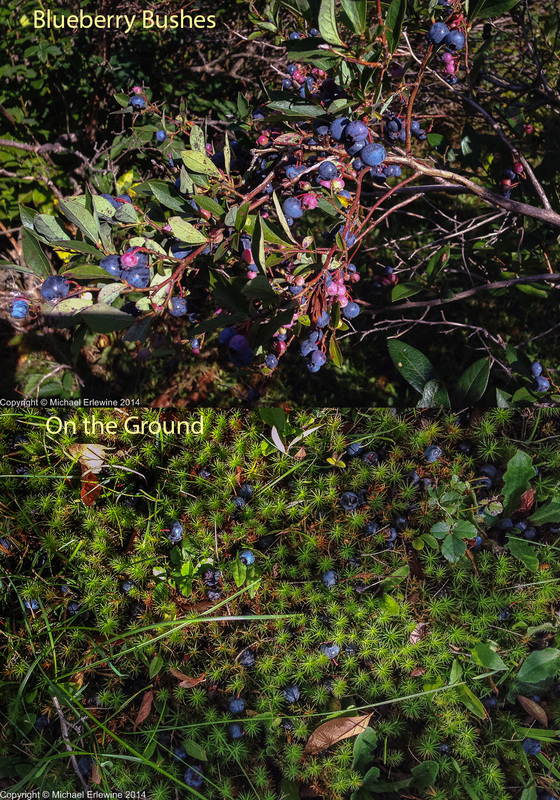 I include a couple of iPhone photos of the blueberry bushes and the berry-covered moss on the ground. My first real dharma teacher, a travelling Rosicrucian initiator, used to say to me "Michael, this is hell, but we each have make our own little heaven in a corner of it." That's about right. We are going to have to learn to enjoy whatever is local to us. I have posted this song written and performed by my daughter May before, but it expresses my views on all-of-the-above better than I can. Her song "Down in the Valley" says it all.